The Iowa Women's Softball League put an exclamation point on the 2018 campaign Saturday by playing an exhibition game at Ellis Park as part of the Cedar Rapids Softball Hall of Fame festivities. The National League team defeated the American League, 4-1, before a nice crowd that enjoyed watching college softball players from a mixture of state institutions. Lauren Kuch of Kirkwood gave the National League a 2-0 lead in the bottom of the first inning with a two-run single. The Nationals made it 4-0 in the fifth inning on a single by Tianna Drahn of UNI, an RBI double by Avery Guy of DMACC, a single by Kuch and an RBI single by Emily Oler of Mount Mercy. 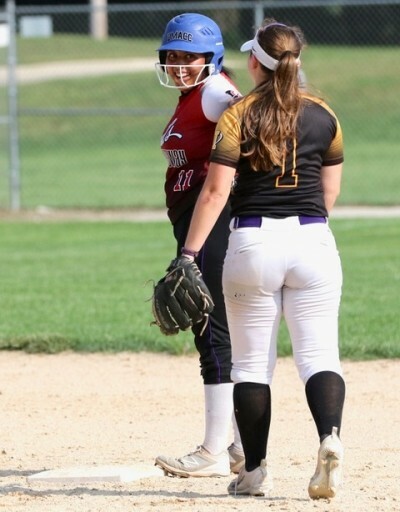 The American League team scored its run in the seventh inning on a consecutive infield singles by Tawny Menster of Mount Mercy, Maddy Ryan of Coe and Brie Tauber of Clarke, followed by a bases-loaded walk by Abby Downs of UNI with nobody out. Emma Olejniczak of UNI worked out of further trouble with the tying runs on base with a ground ball and two fly balls to end the game. Jenna Schwartzhoff of Clarke, Oler and Olejniczak shared the pitching for the National League. Brooke Craig of UNI, Menster and Ryan did the pitching for the American League. Drahn, Kuch and Payton Bruner of Mount Mercy had two hits for the National League team. Tauber had two hits for the American League squad.